Actor Luverne Seifert demonstrates techniques of Ten Thousand Things, which brings free, low-budget, high-quality theater to people who are not rich. A new theater company trains actors to do high-quality, free performances for new, nontraditional audiences. Somehow I knew it would be based in Minneapolis, a hotbed of theatrical innovation in the late 1990s when I lived there. Theresa J. Beckhusen reported the story at American Theatre. 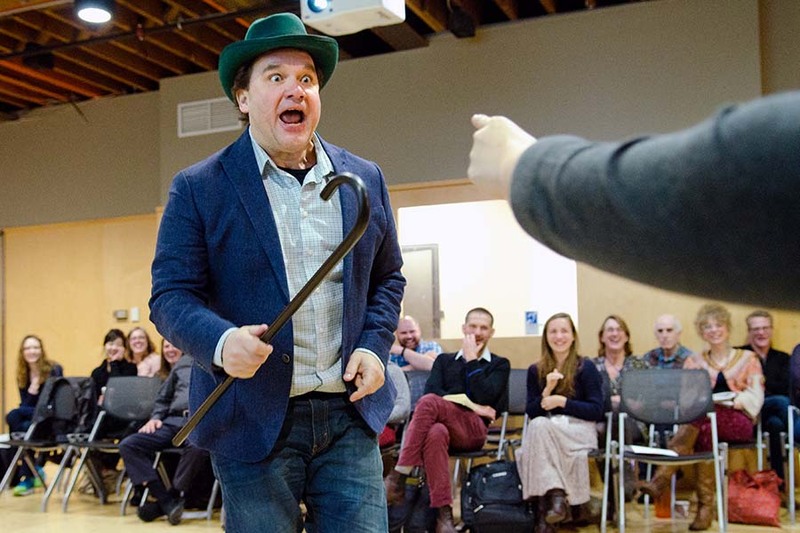 “The gathering drew around 100 theatre makers from across the country to compare notes about working with the grass-roots theatrical model championed by Hensley’s company. Its motto could be fairly summed up as … art for not-rich people. “TTT productions are performed in the round, in whatever space their tour sites have available. … Actors mingle with audience members, interacting before, during, and after performances. There’s more at American Theatre, here, where you can see how different TTT groups manage to fund free performances. So much art seems to be made for rich people, whether performing arts or visual. Think of all we see in museums and at high-end craft shows, plus the operas and symphonies and plays. I really like the stories you bring to us about the people who remember the broader, not-rich audiences.